In August 2004, I wrote about 2 Historic Trail issues from Man-a-Hattin Lodge #82. Subsequently I learned from David Axxx. The former Lodge advisor, that Man-A-Hattin Lodge has always sponsored the Old New York Historic Trail. While earlier issues for the Trail did not contain the Lodge name or number, they were bought, paid and issued by the lodge. 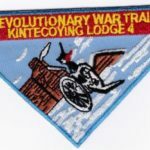 there were at least one solid and several twill varieties of the trail patches issued by the Lodge. By that arguement, I would think that these items would be considered lodge issues. Of course your mileage may vary. I have arbitrarily called this the R2 although I do not know when it was issued in relation to the R1. I’m surfing the web and this caught my attention, because I designed it in the late 1970’s. As illustrated, the original design was 3.5″ diameter. Years later subsequent orders had twill backgrounds and/or 3″ diamter. 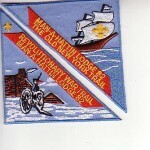 This round patch with staue and boat replaced the previous 4″ square MANHATTES design issued by the Lodge. Let me know if you want a picture of the MANHATTES patch. Joe, doubt this will reach you after seven years, but do you have any of those round patches left?? We’ve got a group of 16 scouts doing the trail in NYC in December. Perhaps you have a stack of patches never used? Long shot I’m sure, thanks. Hi Bill, bet you were surprised to get a reply so many years later to your post! Yes, I have found the site you mention with the current, triangle/square patches for the two trails. I was specifically interested in the round Old NY patch that is shown in this thread. As Joe Ryan mentioned that he’d created the patch, I’d thought there was a chance he might have a bunch in a dusty box somewhere. 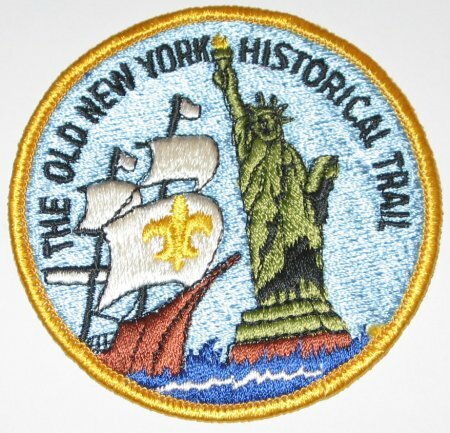 Our scouts likely won’t be doing the Revolutionary War NY trail, as we’re not local (Delaware), so I thought that the round patches would be nicer rather than “half” of a two part newer patch. Thanks for the reply! Wish you Luck in your search, but Man-A-Hattin Lodge itself ran out of the rounds and went to the two triangle design back in 2004. They used this design since then, even after the Kintecoying merger until they ran out of the old patches within the last year. the old versions do pop up on eBay occasionally but I have never seen them offered as more than the odd single patch.